Pack size: 1 x 30g tube. Blepharitis can be the bane of contact lens wearers' lives. It can result from drying of the eyes caused by constant lens wearing, and causes inflammation and itching which can be a real pain. 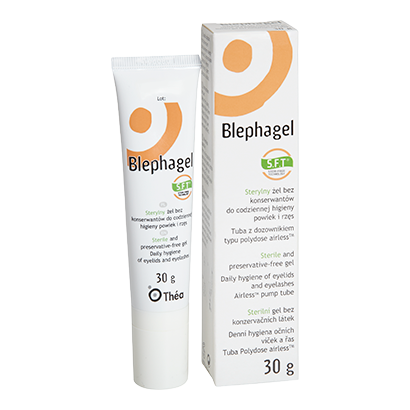 Blephagel Hypoallergenic Gel provides a superbly effective solution to blepharitis. But it is tailored to dry eyes sufferers who also have sensitive skin, being able to soothe itchy, painful eyes without irritating the skin around the eyes. • The tissue in the eyelids and around the eye can be susceptible to inflammation, so for some people the gentle action of Blephagel Hypoallergenic Gel will be a necessity. • Blephagel Hypoallergenic Gel is simple to use. Just apply a small amount underneath the eyelids during the day. You can use a cotton wool swab or gauze pad, as long as a fresh one is used for each eyelid. • The gel can also be used overnight for effective eyelid hygiene. • Produced by the lab technicians of vision experts SpectrumThea, Blephagel is the industry leader in blepharitis therapy. • Comes in a handy 30g tube, which can be easily applied to the affected areas. 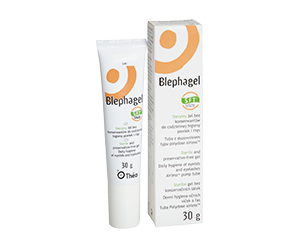 Many lens wearers experience blepharitis, and if you are one of them, Blephagel Hypoallergenic Gel could be ideal. Perfect for anyone who has sensitive skin and suffers from dry eyes.